Over the past 40 years the political life of Richard Nixon continues to make for great drama. The same goes for the court of Henry VIII. That period in history with its religious, political, military and romantic conflict provides more than enough intrigue for these stories to be retold again and again. Numerous movies have been made from the points of view of the period’s colourful cast of characters: Anne Boleyn, Thomas Cromwell, Henry VIII, Catherine of Aragon, young Elizabeth I, Cardinal Wolsey, Jane Seymour, etc. A Man for All Seasons tells the story from the point of view of Sir Thomas More, the legendary British statesman who defied the King’s decision to secede and was ultimately beheaded. The film was the big winner at the Oscars in 1966 winning the major awards, including Best Picture, Best Director, Best Actor and Best Screenplay. The film still stands out above most other dramatizations of the period thanks to Robert Bolt’s smart screenplay and Paul Scofield’s mesmerizing Oscar winning performance as More. As everyone knows, it’s the 16th century and King Henry VIII (Robert Shaw) has fallen in love with Anne Boleyn and desires to get a divorce from his current wife, Spanish Royal Catherine of Aragon. This would require an annulment by the Pope – a request which would likely not be granted. 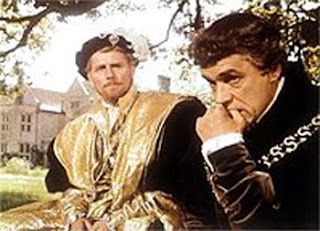 The King desires the support of his good friend and new Chancellor of the kingdom, Sir Thomas More (Paul Scofield). Despite their friendship and the political ramifications of defying the King, More’s personal scruples and stubbornness with the law prevents him from going along – an act which would see him tried for treason. There is such a large story to be told, but Bolt (whose screenplay was based on his own play) and Zinneman make a smart and concerted decision to stay with More’s point of view. We never see Anne Boleyn or Catherine, and the locations include only More’s home and the court in which he is tried. As a result, the filmmakers assume the audience has some background knowledge of this political situation. Anchored by More’s performance, the heart of the film is his steadfast belief in the law. The internal struggle for More is not whether the King has the right to divorce his wife, but the effect his decisions would have on his family. More has the noble belief that in death his surviving family will retain the honour of his sacrifice. Of course, in the reality of the situation his wife cannot see the value in this. It all makes for a complicated web of conflict. A Man for All Seasons is not a biopic of More, and so there’s lots about this influential man left out of the movie. His ardent discreditation of Protestantism is briefly explored, but we're teased enough to think that More’s stubbornness is idealistic but ignoble. And Scofield plays these contradictions with great subtlety. The finale of the film is More’s trial, which is dramatized with the same battle of intellect, words and wills as the finale of Frost/Nixon. For More, it's a fight to retain his freedom without the sacrifice of his moral beliefs. What happened to the star ratings?